English with Germans at Camp. Would you like to serve the Lord in an unforgettable and possibly life transforming way? Are you able to work in a team, and adapt to some big cultural differences? Perhaps God is calling you to join a team this summer. The Reformed Episcopal Church is sponsoring Short-Term Mission Trips to Germany as years before. Please read the following information and ask the Lord if you can help out. Since 2017 we linked arms with another Youth Organization called. “Atlantic Bridge” http://atlanticbridge.org/ through friendship with the European Director John Oostdyk. Beside young people from Germany we are inviting now also others from the European Union. Presently we expect small teams from: the Netherlands( 16-10 from), 10 from Hungary, 10 from Czech Republic, 3-5 from UK. The other European participants will depart to different Mission Tours into Czech Republic and Hungary. At the end of separate Mission Tours most Groups will meet in the German City of Dresden for a final combined Youth Mission Meeting. The REC team will stay in Berlin with their host-church till Sunday and participate either in German or English Worship services. Overnights during that time are planned to be in a Youth Hostel. young people from 18-30 years old as staff and helpers. (If younger 15 – 17 years you need special permission by your parents and recommendation by your pastor. If you are 15-17 and not a staff member at “Anglican Bridge” Camp you are welcome to register as a PARTICIPANT. Anglican Way at “Anglican Bridge” at Morning Prayer and Holy Communion. 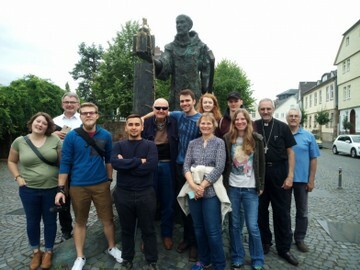 St. Boniface Memorial and Cathedral in Fritzlar; Monday-till Wednesday-> Preparation for “Anglican Bridge”. Wittenberg (Luther’s Seminary & Museum). July 31 (Tuesday) Early Morning Frankfurt Airport, returning to the US. Stay longer to work with us during the next event: “Summer Music Festival” July 28.- August 5. www.sommermusikfest.de. Return to the USA some days after August 6. or 7. Without extra cost. You help in our restaurant and cleaning areas. Notify us if you are interested, we pay you 100,- Euro extra for these days. No cost for staff members (Work-Study: K.-Camp pays for you). (Morning: work projects / food preparation, etc. 3 ½ hrs morning. Afternoon: 3 hrs practice and preparation for A.B.-Camp). • Extras to think about: 20,- € pocket money ?? during Camp, coke, snacks, ice cream etc. a) Eisenach, Buchenwald, (Weimar) Wittenberg, Berlin. a youth hostel the calculated price will be reimbursed to you at the end of the tour. Send in the registration form not later than March 30th 2018. If earlier and you are accepted, you might be able buy a cheaper air ticket. If this is your first Mission to REC Germany and Knuellcamp we need to hear from your Pastor or two persons outside of your family who would support your serving on the Summer Team in Germany. Ask the two people you named on the form for references to send us separately an email, etc. - not more than one page - stating some reasons to support your going on the mission trip, and 1) in what way it would profit you 2) as well as the ministry in Germany. (should arrive till March 30th at Knuellcamp). Evaluation and decision about number of people being accepted will be finalized between now and April 6th. You will receive an answer as soon as possible if you apply earlier. at Youth Hostels as early as possible – air tickets are now still reasonable). This first payment will cover the down payment for the advanced booking of the youth hostel only. Make sure you possess a valid ID Card or Passport for Germany. Schwarzenborn liegt im Schwalm-Eder-Kreis etwa 13,5 km entfernt von Homberg (Efze) im Hochknüll (Knüll-Gebirge). Es besteht eine gute Verkehrsanbindung und gleichzeitig findest Du bei uns viel Ruhe, Entspannung und Natur pur mit super-sauberer Luft. Abseits der Ballungsräume in ca. 620 m Höhe im Nordwestteil der Gemarkung Schwarzenborn. Das Knüll-Camp mit dem Knüllköpfchen befindet sich westlich von Bad Hersfeld, östlich von Schwalmstadt, sowie südlich von Homberg (Efze).